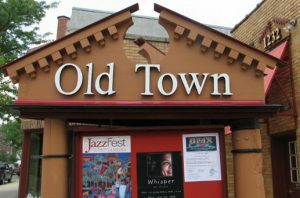 The Old Town Commercial Association is a non-profit organization dedicated to the revitalization of Lansing’s Old Town through socioeconomic development, historic preservation, business recruitment and community outreach. Rich and vibrant streetscapes provide a gateway to our livable, walkable and family-friendly community. Residents of Old Town and surrounding neighborhoods are invested and engaged in the success of the Old Town community. 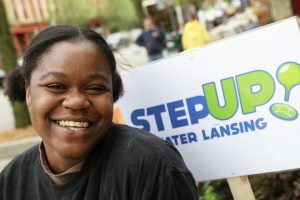 To maintain a vibrant business community in Lansing’s historic Old Town district by providing services and opportunities that foster economic growth and community engagement. Old Town Lansing is the cultural and creative district of Lansing. Our community offers unique experiences through special events, incredible people, eclectic shops and a rich history. Our buildings are beautifully restored for residents and businesses of all backgrounds; our infrastructure is well maintained by sustainable resources. Our diverse mix of destination retail, creative and entertainment businesses offers products and services that are high in quality and one of a kind to the Old Town district. We continue to value our heritage, volunteers and stakeholders who dedicate their resources to make Old Town a destination. 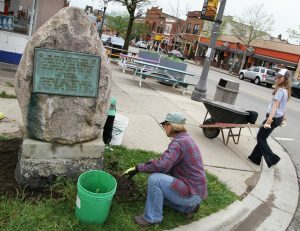 As in any small town, people who live and work in Old Town take pride in the history lessons their hometown offers them. Filled with hope and determination, sadness and success, the tale of Old Town’s ancestors is more intriguing each time it is revisited. A surveying crew moving westward across Michigan in 1825 stopped along the Grand River Indian Trail at the apex of the Grand River. Their mission was to plot and chart land that would someday be known as Old Town. Eleven years later New York land speculators James Seymour and Jacob Cooley purchased the land from the federal government. In 1842, the area was officially named Lansing Township. Around the same time, John Burchard of Mason acquired a section of land from James Seymour. Burchard became the first residential settler in the Lansing area. Burchard and his family settled into a small cabin along the Indian Trail on the corner of Cesar E. Chavez Avenue (formerly Grand River Avenue) and Center Street – in close proximity to where the former Tate’s Freeze stands today. The Grand River’s first dam was built nearby in 1843 and was used to power the area’s first sawmill. Tragically, John Burchard drowned a year later, attempting to fix the dam. Later that same year, Joab Page, his son and three daughters moved into the Burchard cabin. An addition was made to the home and it was used as a tavern for weary travelers. A Methodist minister conducted Lansing’s first church service in the living quarters of the cabin in 1845. The Page cabin also served as Lansing’s meeting hall and township court. As the settlement of Lansing grew, James Seymour began to make improvements on his investment property. He financed the construction of the first wooden bridge across the Grand River. It connected the Grand River Indian Trail (present day Cesar E. Chavez Avenue) and the two forking paths on either side. 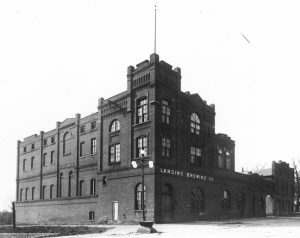 Lansing’s first school was also built in the Old Town area, at the southeast corner of Franklin Avenue (Cesar E. Chavez Ave.) and Cedar Street (the site of the former Temple Club). The school also provided a meeting space for church congregations. Seymour lobbied for the construction of the new State Capitol Building to be located within his holdings in the Old Town area. 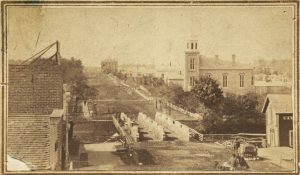 But in 1847, Governor William Greenly selected a site approximately two miles from Lansing’s original Old Town settlement. 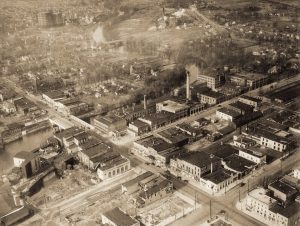 Seymour recovered quickly from the loss with new plans for the development of North Lansing – now known as Old Town. Realizing that traveling legislators would need temporary housing during their frequent trips to the capitol, Seymour began construction on a hotel at the corner of Franklin Avenue and Center Street. In January of 1848, The Seymour House opened for business in time for the first legislature session. Over the next 150 years, Old Town saw many changes. Growth brought prosperity and a great blue-collar community. Visitors to Old Town often saw and heard “North Lansing against the World.” But, soon the boom came to an end. By the latter part of the twentieth century, Old Town had become a fragmented shell of the bustling area it once was. Buildings were abandoned or burned out. People lost interest in local downtowns across the country, and Old Town was no exception. Some very dedicated people, including the late Robert Busby, decided that the decay of Old Town was unacceptable. For the last 30 years, these “urban pioneers” have been working hard to revitalize Old Town to make it a better place to live, work, and shop. 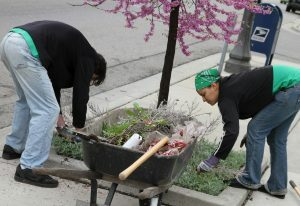 In 1996, the Main Street program was established in Old Town. Since then, crime rates have fallen to the lowest in the city, building vacancy has dropped from 90 percent to less than 10 percent, and Old Town is proud to be a home to some of the finest art and entertainment venues in mid-Michigan. In 2006, Old Town was named a Michigan Main Street program area under Governor Granholm’s Cool Cities Initiative; it continues to operate under Main Street’s four point approach. Together with several other partners, such as the Michigan Institute for Contemporary Arts (MICA) formerly the Old Town Business and Art Development Association (OTBADA), the City of Lansing, the Principal Shopping District (PSD)/Downtown Lansing, Inc., the Turner-Dodge House and others, Old Town has become a thriving environment of art, festivals, boutiques and creative businesses and residents dedicated to the revitalization of this historic district. Through hard work and determination, Old Town has prospered and grown into one of the finest areas in mid-Michigan. Old Town may not have reached its full potential yet, but thanks to the support of the community, it is on its way.